UpToDate for iOS is an essential medical app for on the go physicians like hospitalists. UpToDate looks great on an iPad, and is easier to read with the larger screen. The ability to search for information on drugs, diagnosis, and treatment at the point of care is essential when providing medical care for complex patients - and this app delivers! Additionally, UpToDate allows you to earn CME at the rate of 0.5 hours of AMA Category 1 credit per search. 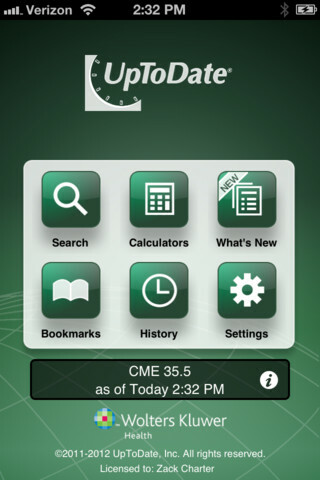 Most physicians can earn an entire year's worth of CME with this app alone. The only downside to this app is the cost of an UpToDate subscription, but when viewed in light of the CME, it is a bargain. Find clinical answers at the point of care or anywhere you need them! Now you can access UpToDate's® current, synthesized clinical information — including evidence-based recommendations — quickly and easily on your iPad, iPhone, or iPod touch.